Is There Any Free Method to Reduce/Compress a Video File Size to Save Space, Send Email, Upload to YouTube/Facebook? Guess you have a spate of video files floating around your PC or Mac, occupying a great proportion of your hard drive. To save the disk space, you may sheer off to avoid the "red light" by stopping adding new media files. That's a shame but not a necessity indeed. This tutorial will recommend you a free and easy solution to compress video files on Windows 10/8.1/7/XP or macOS (10.13.5 included). Compressing a video not only frees up space of the computer, since from time to time you must have the need to share interesting GoPro/DJI/camera/iPhone videos with other, either via YouTube, Facebook or Email, like you do with funny photos. But not as lucky as photos, videos will take up much more rooms. Let's turn the rocket science into an easy task with free WinX Video Converter, which can compress a wide range of videos to the file size you'll need for different uses, up to 70% compression rate! At the same time, the image quality won't get drowned. The following text will show you how to free reduce a video on Windows PC or compress a video on Mac (iMac/MacBook/Mac Pro), respectively. Before that, please download the proper edition of the program by clicking the corresponding download button right below. 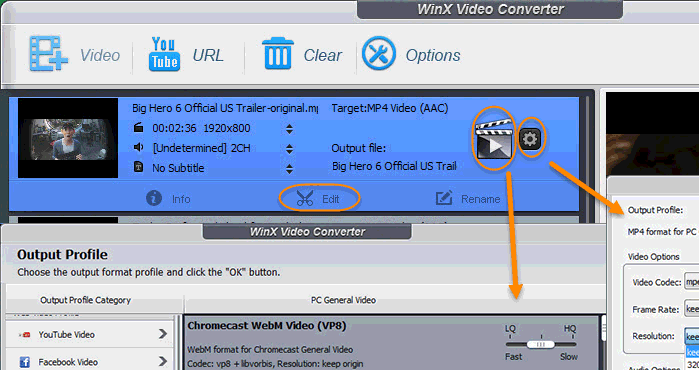 WinX Video Converter will help you free convert video formats (e.g. : MKV to MP4, H.265 to H.264, MTS to AVC), change video resolutions, or turn the video definition, for example, from 4K 2160p to HD 1080p/720p so as to reduce videos successfully and speedily. It is the No.1 fast and clean video converter freeware on PC or Mac! After downloading the Windows version of the top free video compressor software, please launch it and get it ready. You'll be shown on compressing a video to a great degree in just 6 steps. Step 1. Add a video file. Click the Plus Video button on the top left of the interface. Browse through your computer, click on the video you need to compress, and hit Open button to add the video source from your Windows (10) PC. 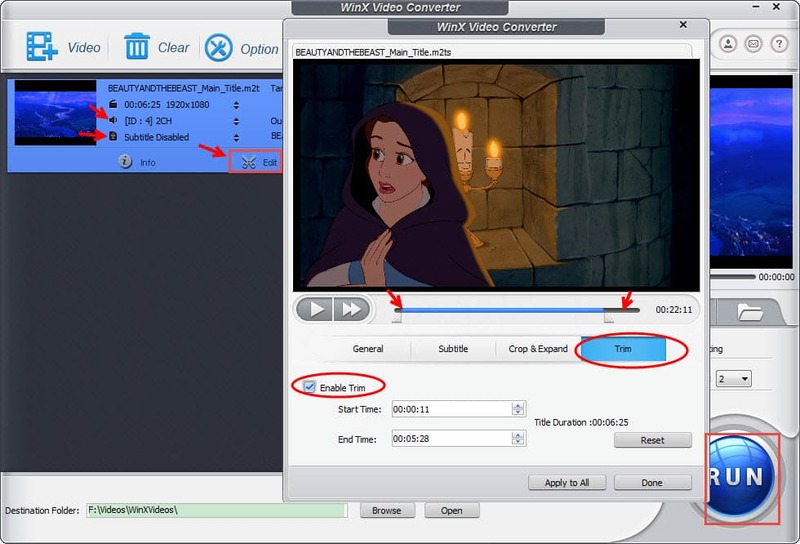 WinX Video Converter allows you to add more than one video at a time for batch compression. Step 2. Convert the video format. Choose a desired output format among what are listed in Output Profile Category. Optionally, change the quality bar to LQ (Low Quality) if you don't mind much on the image effect. Step 3. Edit video resolution and so on. 3. Bit rate, sample rate for audio can be set lower to get a smaller size. Step 4. Disable the subtitle track and avoid multiple audio tracks. If the movie or video has multiple subtitle tracks in the language you can actually understand, there is no need to use the subtitle. So, choose "Subtitle Disabled" in the Subtitle option. Reduce the audio tracks as many as you can in the Sound item. Note: The "Subtitle" feature also enables you to add Extra subtitle (.srt) files downloaded from the internet. Step 5. Reduce time length of the video optionally. Click the scissors icon and enter the detailed setting Window. Tap "Trim" button, check "Enable Trim" and cut down the unwanted part of the video, which is also a feasible way to reduce the large video size. Step 6. Click "RUN" to start. Do not choose "Use High Quality Engine" or "Deinterlacing" option if you need your HD video better compressed. Uncheck "Safe Mode" button and choose a higher CPU Core Use if you want a faster conversion process. Then click "RUN" button and start the conversion and compression at the same time. "I end up with finding no good video compressor on Mac for shrinking videos for iMovie, Email and so on, since the output video image is always not as expected. Is there any freeware to compress a video on Mac easily?" Shrinking a video on Mac OS using WinX Video Converter for Mac (free & clean) has much in common with that on Windows. Step 1. Import video file. Add one or more (HD/4K) video file to be compressed from your Mac by clicking "+" button. Select MP4 Video with codec h264+aac because H.264 and AAC can output a quite small size nearly without quality deterioration. Step 3. Change output profile in Tool bar. You can change Video/Audio Codec, Frame Rate, Aspect Ratio or audio channel, and customize Resolution for a smaller file size to output. Step 4. Edit the video. In "Edit" tab in the File List window, Subtitle can be disabled and Trimming can be enabled by adjusting the Start Time and End Time. Step 5. Set the Destination Folder. After setting, click Browse button on the bottom left and choose a destination folder to save the output file. Step 6. Start free video compression. 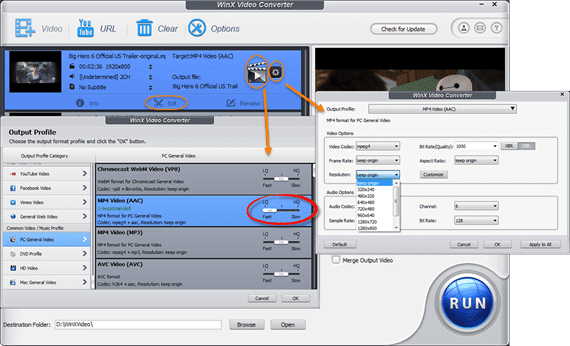 Download Free WinX Video Compressor for Windows or Mac Now! How to Compress a Video to Email to Family and Friends? Q: I need to clarify a question regarding being able to email a 12 minute video to family and friends. I have converted the original from my iPhone 6 to both mp4 or m4v formats. Is there a way to convert it one more time to a small enough format to go as an email attachment? I use Gmail currently. I believe it gives me about 25 mb maximum. Answer: It is necessary to reduce video files into smaller size or convert HD/4K video like MKV, M2TS, H.265/HEVC to a more compressed video format (such as MP4, AVI, WMV) for email. Read detailed guide of compressing video for email. What Is the Best Size for YouTube Uploading? Q: What are the best video size, dimension and aspect ratio to compress video for YouTube Uploading? Answer: Only a 2GB video file can be uploaded from YouTube webpage, but 20GB is allowed when an up-to-date browser is used. The aspect ratio of 16:9 is the best choice. Read on for other tips of best size for YouTube video uploading. What Are the Best Software for Compressing a Video on Windows 10/Mac Computer? Q: I've tried a good many video shrinking tools, such as Movavi Video Converter and Freemake Free Movie Maker, but none is completely agrees with my wishes. Would you recommend the best video compressor in the world? ▶ Also serves as a YouTube video downloader, HD video/DVD/audio converter, video editor and screen recorder.